Choosing your wedding flowers can be a lot of fun. There are quite a few options for the type, meaning, and look of flowers for bouquets, tables, and other wedding decor. One sure way of saving money on flowers is to use flowers from a garden if possible. If you, a friend or a relative do not have a garden, perhaps a neighbor does or someone you know, knows someone who does. Be brave! Be VERY brave! Ask if you can cut some of their flowers for your wedding. You never know, this might be just the ticket for having fresh flowers at little or no cost. Another way of saving money on wedding flowers, is to use silk. Many silk flowers look so real you have to really examine them or touch them to know the difference. This option is also great at saving the expense of preserving your flowers. They will last you a lifetime. You can also choose not to use flowers, but to use things found in nature, or things that have special meaning, to carry and for decorations. 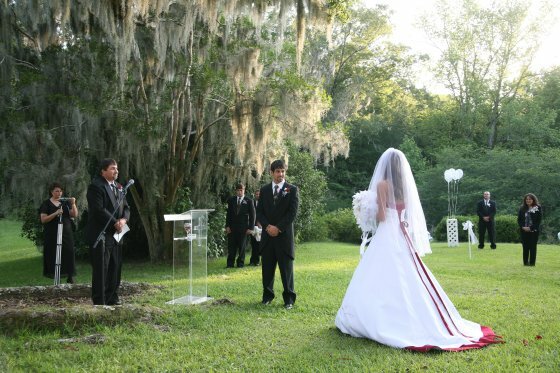 Some brides simply carry a Bible with some ribbon dangling. 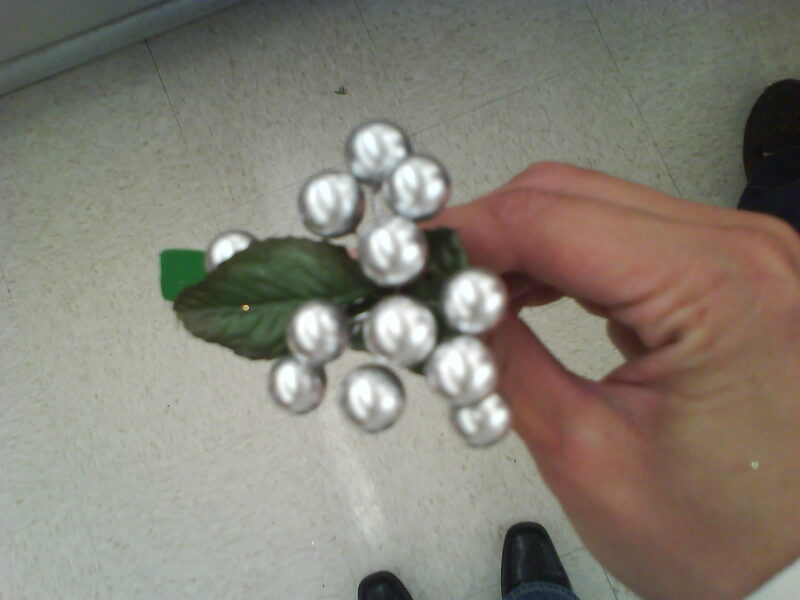 And then again, others carry bouquets made of paper flowers or brooches. This is your wedding. You can do what you like, and there is no law that says you have to have flowers. As for decorations, a beautiful backyard backdrop, tulle or other lightweight fabric, some ribbon, and some potted plants can all make for beautiful accents and save you money. If you do choose real flowers, carrying one or even two or three flowers with a little ribbon, is nice and much less costly than the big bouquet. 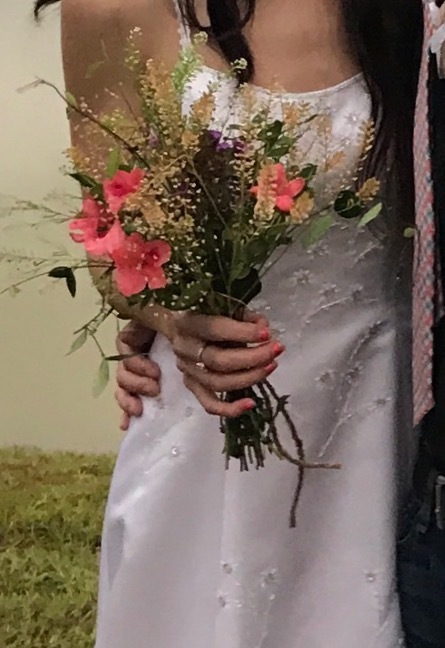 In my daughter's wedding each bridesmaid carried a single flower (One carried a lilly. One carried a rose. And one carried a magnolia.) with ribbon. 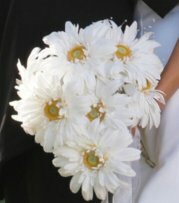 The Maid of Honor carried one of each (a rose, a lilly, a magnolia and a daisy). 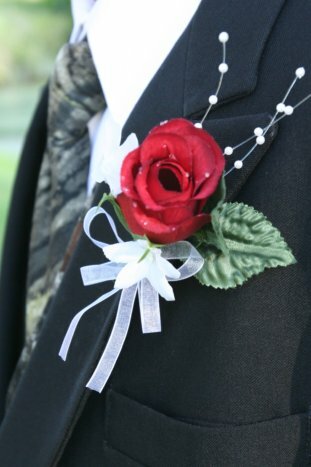 For the groomsmen's boutonnieres, there are lots of inexpensive options. Berries, babies breath, succulants or even leaves are great frugal choices. The berries below were used for a winter wedding boutonniere. An artificial rose with some beaded sprigs was the option to save us money. We actually found these on e-bay for very little, but they were really nice looking. Think things through, especially in light of your budget, check out some web searches and magazines, knock around some ideas with whomever is helping you plan your wedding. I'm sure you'll come up with just the right option for you. Chcek out for some great selections.